The Euroarab Foundation thanks every organisation and person that joined the event last Wednesday. NGOs, artists, journalists, activists and students from 20 different countries, asked for the end of wars and sympathized with the refugees and inmigrants from all over the world, at the public event of support for refugees and victims of violence at Plaza del Carmen, in Granada. The exhibition “Out of Text. Journals of Peace, from Libya to Granada” of Matug Aborawi, that he presents at the Euroarab Foundation and can be visited until the 31st January, was inaugurated with a public event where NGOs, artists, musicians, journalists and students from Granada participated and, with their voices, joined the messages of support that were sent from 19 countries and were projected during the event. 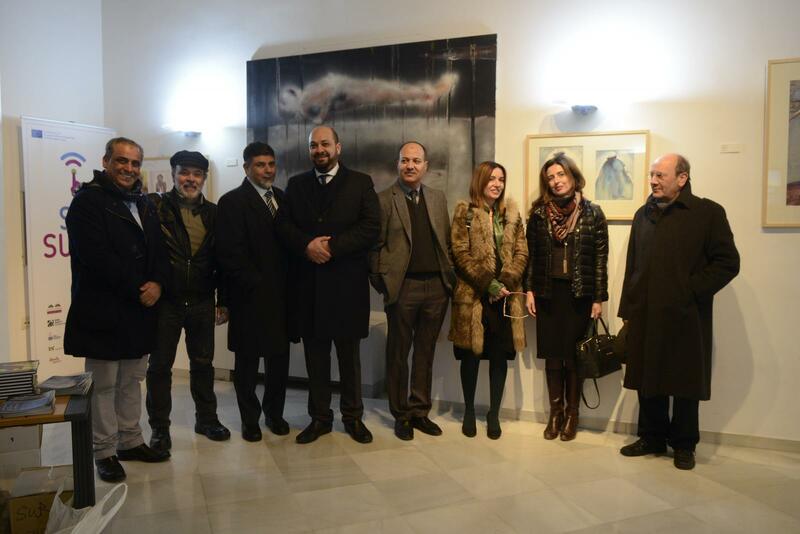 With this public event the exhibition from the Libyan artista was inaugurated. An exhibition composed by paintings in the form of notebooks and large scale paintings. Oils, acrylics and enamels show the different experiences of the artista in Granada, until 2015, and his native land, Libya, with the war as a background. The painters’ experiences during both periods can be understood while visiting the exhibition. The common point of this event were the messages against war and to support refugees around the world. This messages could be seen at the public event that took place in Granada on Wednesday, where more than 80 people participated. NGOs, artists, activists, musicians, journalists and students participated from Granada and introduced every message recorded and sent from 20 different countries. The event, which could be followed through the Euroarab Foundation’s Youtube cannel, counted on the participation of several artists, such as Manu Chao, who composed a song dedicated to the event with his band Ti.Po.Ta. called “Do you hear me calling”. From Granada, other musicians also participated, like the flamenco singer Juan Pinilla, the Moroccan musician Abdellah Ghailand and the British trumpet player David Defreis. Visual artists also joined this event, and so there were greetings from the Faculty of Fine Arts of the University of Tripoli (Libya) and from the University of Athens. The students from the Department of Drawing II of the Faculty of Fine Arts of the University of Granada and the students of Scenic Arts of the High School Severo Ochoa also participated in the event. Also, representants of NGOs and journalists of Granada presented the messages recorded and sent from other countries. This project and the exhibition of Matug Aborawi has the goal to inform and raise awareness about the reality of refugees and inmigrants, and the “suicidal” journey that they make and takes sometimes years, to reach safety from the conflicts that devastate their regions. “Out of Text. Journals of Peace, from Libya to Granada” is a project from the Euroarab Foundation, sponsored by the City Council of Granada. The project has the Embassy of Libya in Spain and the University of Tripoli with its Faculty of Fine Arts as collaborators, as well as the Faculty of Fine Arts of the University of Granada and its Department of Drawing, the Syndicate of Journalists of Andalucia and different NGOs from Granada. From 10am to 2pm and from 5pm to 8pm, Monday to Thursday. Fridays only in the mornings. * From the 26th December to the 5th January, the exhibition will be open to the public in the mornings.